Growing up in Quebec, Briere has always wanted to play for the historic Canadiens. Being a Habs fan, Briere is well aware how hostile it can be to be a Montreal player. 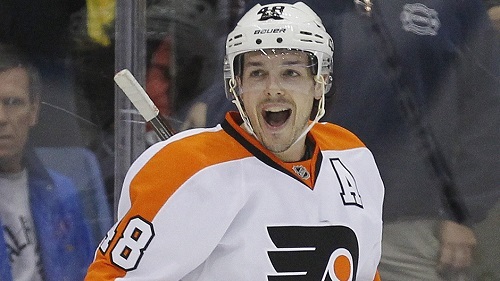 Especially after Briere chose the Flyers over the Habs the last time he was a free agent in 2007. But at the same time, he isn’t worried about the pressure. Former Philadelphia Flyers forward Danny Briere, who was bought out of his contract last week, has come to terms on a new deal with the Montreal Canadiens. And at 35, this could be Briere’s last opportunity to play for Montreal. So he felt he had to take it. The one thing that worries fans about Briere is his size. At only 5’10, he isn’t the smallest guy on the team which shows how small they really are. But to fix that size, the team pulled off a small trade with the Florida Panthers, sending Philippe Lefebvre and a 7th round pick in 2014 south for tough-guy George Parros. At 6’5, Parros is a heavy-weight guy (over 1,000 penalty minutes) who won’t contribute offensively but also won’t back down to a fight. As of late Friday afternoon, these are the only two players Montreal has added. With three months before the season starts, they could add some small pieces but for now the Canadiens appear confident in their roster and don’t want to give up much. That quote says all you can expect from Montreal this summer. But if anything does happen, HOHM will have it covered.